Pakatan Rakyat (PR) is playing psychological warfare exactly like what they did in the run-up to 2008 general election that saw BN won with a slim majority. Same method and style, beginning of this week, the Centre of Independent Survey created the survey result that PM Najib Tun Razak’s popularity had dropped by three percent to just 47 percent. And yesterday, Bank Islam’s Chief Economist Azrul Azwar Ahmad Tajuddin presented a figure that BN was likely to win only between 97 and 107 of the 222 parliamentary seats — insufficient to reform the next administration. Azrul said this when presenting a paper at the Regional Outlook Forum in Singapore yesterday, adding that the computations took into account such as race and demographics. Worse is that Azrul said he did not rule out the ‘possibility of economic sabotage’ by businesses and civil servants aligned to BN. Azrul’s paper reflected his true political alignment rather than a professional economist’s outlook which gave away whatever camouflage in Bank Islam he has been hiding all this while. His paper was truly a political opinion than an economist that produces a true and accurate outlook and the paper truly reflected Anwar’s vicious mind. He even opined that there would be economic sabotage if Pakatan is to win the coming general election, putting psychological fear to voters particularly the Chinese on the impending outcome. Treacherous and dangerous, Azrul should be taken to task by the bank’s management for presenting such a paper, accusing civil servants and businessmen of taking politics to a dangerous level. Anwar’s vicious political mind is to see chaos so that he can just ride the chaotic tide to divide and rule, and of course to cheat and lie, which is best done when the situation is chaotic. 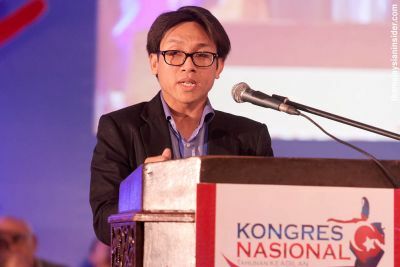 Azrul is actually a member of PKR Putrajaya and had delivered a paper on Pakatan's economic policies in Buku Jingga during PR's 2011 convention in Pulai Spring, Johor. In the forum in Singapore, he presented the paper in the capacity of Bank Islam's employee that Pakatan will win coming general election with a slim margin. What the opposition is playing now is to get professionals to give out poor ratings to the present ruling coalition as the general election nears so that psychologically voters would then opt for the winning party as being pictured by the professionals. After all who would want to argue with professionals who are considered as highly qualified to give assessments – right or wrong another matter altogether. Azrul’s views as presented in Singapore reflected that he has been Anwar’s boy, placed in the bank together with more of such people in Bank Islam all over the country, the young educated liberals who idolized Anwar as though the latter is demi-god. Azrul is just one of many professionals Anwar is using to drum up the psychological warfare as the run-up to the general election given that all attempts at discrediting Prime Minister Najib Tun Razak fell flat. However, the Singapore Straits Times that reported Azrul’s presentation did not put down the detail how Azrul came to that conclusion. With just few more months to general election, Anwar’s psychological warfare is now at full speed and Azrul is one of those who have been given the chance emerge, alongside Rafizi to create doubts among voters. 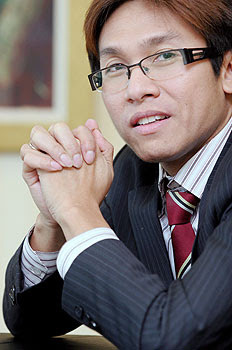 For your information this person also has been appeard in Berita Harian in 2011, Personality Site : Read here.